Students around the country, including Keizer, are taking to the streets to change the conversation around school safety, but students can feel especially vulnerable to the whims of adults who believe other priorities should come first. The American Civil Liberties Union is spreading the word on how and when students can safely protest, and what to expect when they run afoul of the rules. On Thursday, March 1, the ACLU held a live video seminar called Students! Know Your Protest Rights to inform potential student protestors in the wake of the shootings at Marjory Stoneman Douglas High School in Parkland, Florida, that killed 14 students and three staff members. Among many local protests throughout the country, two nationwide protests have been planned for March. The first, a walkout, took place on Wednesday, March 14. Students at Claggett Creek and Whiteaker middle schools and McNary High School took part. The second major event will be the March For Our Lives protest on Saturday, March 24. Salem area students will take part in with a planned protest at the state Capitol. Supporters will gather at 11 a.m. at the steps to listen to speakers before the event begins at 11:30 a.m. The goal is to pressure Congress into passing stricter gun safety legislation. The case involved students who, in protest of the Vietnam War, wore black armbands to school. Five of them were suspended for the action. The ruling declared the singling out and suspension of these students for a non-disruptive protest to be unconstitutional in accordance with the first and fourteenth amendments. On the subject of walkouts specifically, the ACLU lawyers stress that schools are not able to punish protesters who miss class any differently than other instances of truancy would be punished. This means that while students can be marked with an absence and face the consequences of that absence, they can not be given blanket suspensions or other punishments based on the ideas or act of walking out in protest. Keizer is no stranger to student protests. In January 2005, students held a sit-in of McNary’s commons to stand with teachers seeking better pay. In May 2006, students from McNary partook in nationwide protests against changes in immigration law. 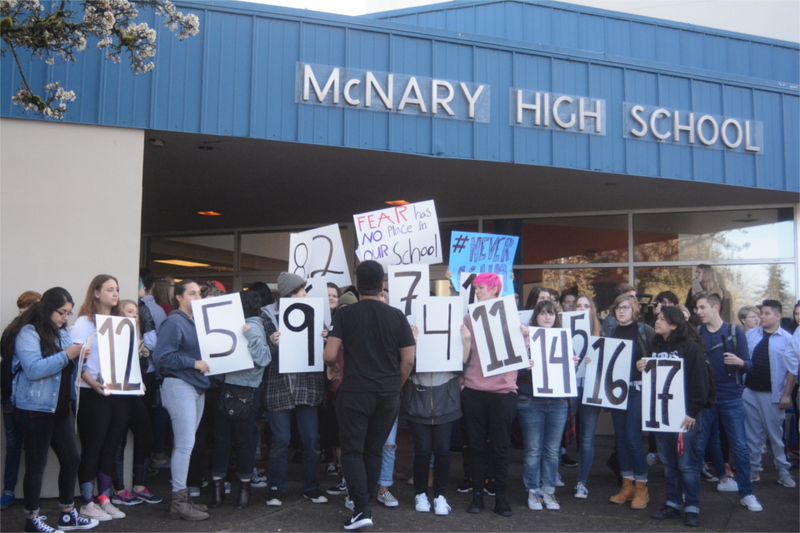 Eleven years later, in 2017, McNary students, in solidarity with other schools around the state, marched on the capital to demand that an act protecting Dreamers be passed. Most recently, in November, students went to the capital to protest mandatory reporting changes for the Salem-Keizer School District, sparking a national conversation on school policy, consent laws, and teen sexuality. The ACLU’s full talk and more information can be found at https://goo.gl/t87aFk. They also encourage anyone who feels their civil liberties have been infringed to contact them at https://www.aclu.org/contact-us.